DIRECT GULF ACCESS WITHOUT GULF FRONT PRICE! NEWLY RENOVATED, COASTAL COTTAGE! 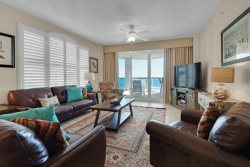 This adorable beach cottage is as close as you can get to direct gulf front without being gulf front! Getting to the beach requires a 30 second walk without crossing any roads. This gives you the advantage of being gulf front without paying the extra rates! This home underwent renovations in 2017 and is a great place to spend your vacation. The entire interior of the house was painted and the wood floors refinished to a beautiful sheen! It also received new lighting, new furniture, all new bedding, and new decor! The overall feel of the house was designed to reflect the natural elements of the beach. Vacationers will enjoy the natural textures and calming elements that are found throughout the gulf coast. The main level of the house has a large great room, dining area, and kitchen combination. This open concept is perfect for groups because it allows you to gather when watching TV, playing games, or eating meals. The living room has large comfortable couches (with one being a queen sleeper sofa), a nice sized flat screen, and a beautiful fireplace. The dining area has a new farmhouse table with benches on both sides and two end chairs to allow seating for 10. The kitchen island also provides seating for 3 more. The dining area opens to a nice deck with a gas grill for your convenience. This main level also has a precious bunk room with a three-tier custom bed that is an instant hit with kids. The bed has a queen on bottom with two twins stacked on top which allows sleeping for 4. This bedroom also connects to the main level bathroom which is a full bath with a shower. The top floor of the home has three additional bedrooms, two bathrooms, and a laundry room. The master bedroom has a beautiful custom king size bed as well as a queen size Murphy bed. This room also has a large flat screen, a large en suite bathroom, as well as a private balcony off the sliding glass doors. The other two bedrooms both have queen sized beds, spacious closets, and flat screen tv's, these two bedrooms share a full-size bathroom which has a tub/shower combination. Below the house, you will find a nice over flow space with room to hang. The owner has provided corn hole and a few other outside games for vacationers to enjoy!
. Please contact us directly to inquire about hosting events at the property.